If the new Johnson line of engines looks slightly reminiscent of a popular engine of a few years ago, namely the Orwick, it isn't just a coincidence. In the hands of a new manufacturer the Johnson engines should become extremely popular in both free flight and control line stunt. With only 18 engines available in time for the 1956 Nationals, 28 trophies were won by competitors using this power plant. Although this is quite an achievement Dynamic Models, Inc., is still making refinements to the design to further improve performance. The first Johnson engine was actually born in October 1955 but these first production jobs did not measure up to the standards set by Hi Johnson. Rather than continue producing an engine that they felt could be improved, Dynamic closed their doors and for the next six months devoted all their energies toward developing their new "hard cylinder" models. The results of these efforts was dramatically proven in their first competitive showing. At the present time Dynamic is producing three sizes: 29, 32, and 35. In the near future a new model with the designation of "stunt" will be introduced. This engine will have a cubic inch displacement of approximately .34 and will be developed primarily for control line stunt and radio control. Dynamic plans to cover the full line in time, with the exception of 1/2A. 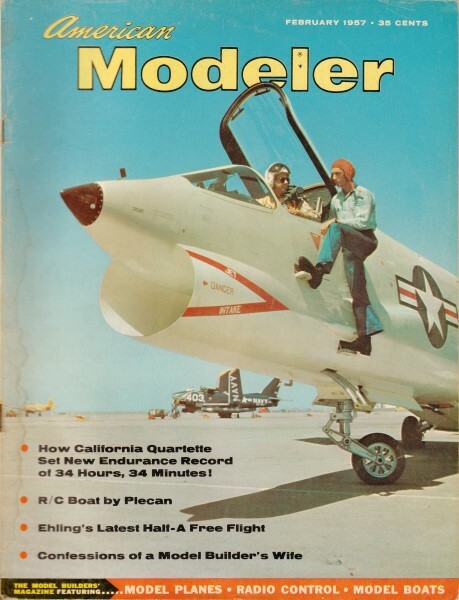 The .35 was developed for combat, free-flight, rat racing and for the stunt flyers who like quite a bit of speed. A bore of .770 and a stroke of .750 would indicate that some speed might have been sacrificed for a little extra power. However the Johnson .35 is lacking in neither. In fact it peaks at a higher rpm than some of the other engines in its class. Ruggedness is reflected in its above-average weight of 6.8 oz. The crankcase, die cast of Alcoa A-380 aluminum, is designed to take the stress and strain of models that sometimes try to fly below ground level. 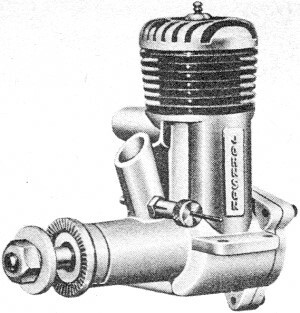 For this reason the front face of the crankcase is left quite heavy as is the journal around the main bearing. Beam mounting lugs are rugged with mounting holes arranged to fall directly in the center of a 3/8" motor mount. The three lugged back plate cover holes can be drilled out for radial mounting and will fit the micro type tank often used in free flight. The wall of the back plate has been left 1/8" thick to accommodate drilling and tapping for pressurized tank combos. Noteworthy features are the lack of a gasket between the cylinder and crankcase and the use of a web support in the bypass. 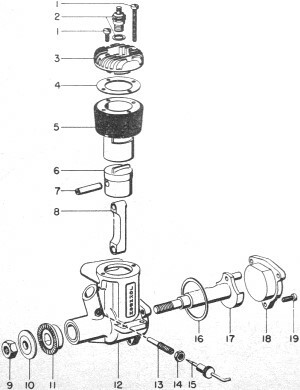 Parts listing 1) head screw; 2) glow plug, gasket; 3) cylinder head; 4) head gasket; 5) cylinder sleeve; 6) piston; 7) wrist pin; 8) con-rod; 9) prop-nut; 10) front washer; 11) drive washer; 12) crankcase and bearing ; 13) needle valve spray bar; 14) needle valve nut; 15) needle valve pin assembly; 16) back plate gasket; 17) crankshaft; 18) back plate; 19) back plate screw. Like the crankcase, the head is massive and is die cast from the same type aluminum alloy. It seats deeply into the cylinder to guard against blowing head gaskets and features a spherical combustion chamber which matches the domed piston. It is held securely in place by six machine screws, two of which extend down through the fins thus holding the head and cylinder barrel to the crank­case. That cylinder barrel, the heart of the "hard cylinder models," is a well guarded secret of Dynamic Models, Inc. and as such they will not divulge the material used or the process used in heat treating. They do say though that the cylinder is as hard as hard chrome and many times as durable since it is integral and not just a plating process. The superficially hardened surface is .006" deep, leaving a tough core and eliminating the possibility of brittleness. Any reworking of the cylinder in the way of hop-up will have to be done with a hand grinder and emery cloth. Piston is slug type and exceptionally light for an engine of this size. Material used is a new process called Meehanite and porosity of the metal is controlled so that the side walls are left porous while the dome (top) is dense. This allows the bearing portion to absorb and hold lubricants during operation. Do not be alarmed when the compression band takes on a grayish look after about one hour's running. This is a characteristic of the material. Although the piston is domed shaped, it also employs a low straight type baffle which does not interfere with the dome theory but does do a better job of scavenging. Connecting rod material is extruded and drawn from 72,000 p.s.i, aluminum of 12% elongation giving a tough hard material with extra long fatigue life. Slots are cut at both the large and small ends to insure sufficient lubrication. Crank shaft is machined in one piece from 4130 chrome-molly aircraft steel. Three holes strategically placed in the shaft journal act as a pressure lubricating system for the main bearing. Main bearing is a sintered meehanite with controlled porosity. It is honed out enough to get into virgin metal. Hi Johnson claims this bearing will outlast any bearing material known. Since it is cast into the crankcase any chance of float is eliminated. Needle valve assembly is drilled-straight-through variety and although the fit is better than most of this type we feel that some improvement in its design would be beneficial. By design, the spray bar cannot be turned around thus the needle valve protruding from the right side of the engine (looking from the front) seems to favor left handed flipping and use of the right hand for operation of the needle valve. However being opposite the exhaust port has its advantages too and perhaps one gets used to its location. During. the tests we found that although there was no noticeable float, the needle valve was very critical on adjustment. Running tests were begun after 1/2 hours of break-in time which seemed quite adequate for the test engine. As recommended by Hi a 10/6 propeller was used. Maximum rpm with this was 13,500. This same rpm was also recorded with a 9/8 prop. Dropping down to a 9/6 prop increased rpm to 14,500. To test its lugging power we tried an 11/6 wide bladed propeller. Speed dropped to just below 10,000 rpm and an excessive amount of vibration was noted. However below 9,000 rpm and above 10,000 rpm our test engine was quite smooth. Starts were quickly made when the engine was primed directly into the exhaust port, but it was not quite as easily restarted when hot.